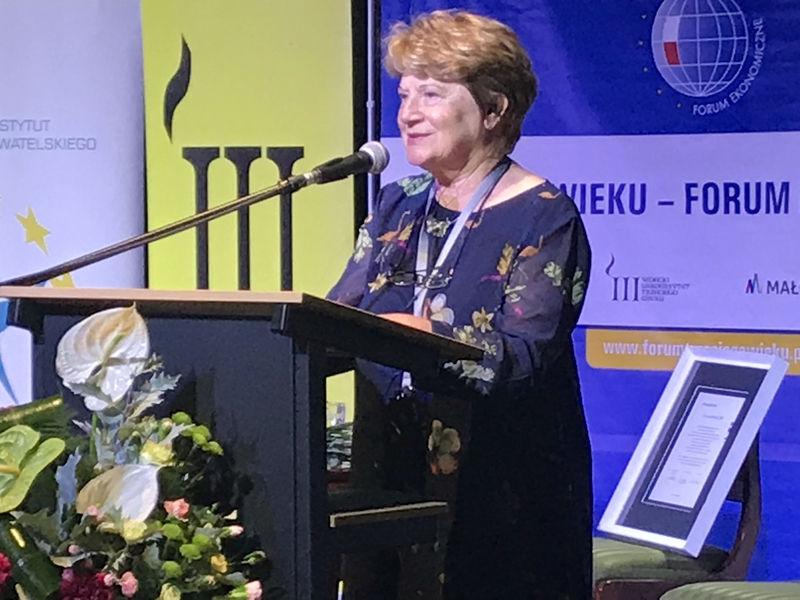 ESU vice-president Janusz Marszalek invited an ESU delegation (Prof. An Hermans, Guido Dumon, Lidmila Nemcova, Ulrich Winz, Margit Hawkes and Sean Hawkes) to participate in the 10th Third Age Forum (5-7 September) in Nowy Sacz and Krynica in Poland. President An Hermans was invited as honorary guest and keynote speaker at the opening session. Mrs Wieslawa Borczyk, president of the organisation committee of the Forum, welcomed her. In her speech, President An Hermans presented the role of ESU, as a meeting place for active senior citizens, an giving voice tot he needs and aspirations of seniors. Other members of the delegation participated in panel discussions during the following days. Before the start of the conference President An Hermans met Mr.Wladyslaw Kosiniak-Kamysz, president of PSL (Polish member party of EPP), who delivered a well appreciated speech in the opening session. Before the start of the Forum, on the 4 September president An Hermans and secretary general Guido Dumon attended a meeting of the Malopokska Council for Senior Policy in Krakow chaired by Vice Marchal Wojciech Kozak and Wioletta Wilinska. The need of collaboration and seniors’ participation in society was discussed. Ms. Wioletta Wilimska, Director of the Regional Centre for Social Policy in Kraków and deputy Chairperson of the Małopolska Council for Senior Citizenship, pointed out that the changing demographic situation poses both a challenge for senior citizens but also an opportunity for the development of the region using the potential of seniors. In the city of Krakow the ESU president and secretary general discussed about senior policy in Krakow An Hermans and Guido Dumon met a delegation of the seniors and policymakers headed by Anna Okońska-Walkowicz, responsible for senior policy and representing the Mayor of the City of Krakow. An Hermans: ‘We are very impressed by the dynamic participation of Polish seniors in all areas of society and in particular by their interest in life long learning and policy making. We hope that we will meet them soon at the European level and that we can inspire and empower each other’.